The Fellowship was fortunate enough to obtain a copy of TERMINATOR SALVATION: THE FINAL BATTLE #1 from Dark Horse Comics. J. Michael Straczynski writes, Pete Woods draws and Matthew Wilson colors. Simon has been sent by John Conner to 2003 to find a guy named Thomas Parnell, who is not a nice man. Skynet has sent three T-800s back to find a terminally ill doctor who will be useful in the future. It’s also putting the finishing touches on a new time door which will presumably change the game. There’s a lot going on in the Terminator-verse thanks to Straczynski and company. This first issue opens up a bunch of questions, such as what Simon can possibly want with Parnell, and what the deal is with Dr. Kogan. And with a 12-issue arc, there’s plenty more on the way. With several plotlines begun and the promise of the end of the war, this is shaping up to be a hell of a ride. This is a grand opening volley in what promises to be an epic final battle. You will not want to miss out on the end of an era. 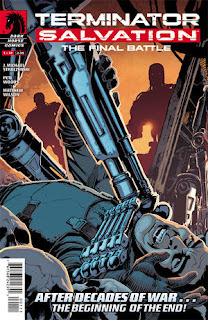 TERMINATOR SALVATION: THE FINAL BATTLE #1 is available now at your FLCS and online at darkhorse.com.